The Court of Appeals for the D.C. Circuit heard the case of Mozilla v. FCC today to determine whether the Federal Communications Commission (FCC) is allowed to repeal its net neutrality rules and abandon its authority over the broadband industry. The case delved into many different legal and technical issues that reveal the extent the FCC is willing to stretch to abandon the Open Internet. On one side sat public interest advocates, local governments, and Internet companies large and small. On the other, the FCC’s legal team was joined by lawyers from the large ISPs arguing in favor of one of the most unpopular decisions in Internet policy history. The FCC’s so-called Restoring Internet Freedom Order, which repealed net neutrality rules, relies on a flawed understanding of how the Internet works. The FCC based its order on the belief that certain functions inherent to operating an ISP qualify ISPs as information services under the Communications Act, not telecommunications services. The courts have already ruled that net neutrality rules can only be applied to telecommunications services. As Kevin Russell, the attorney representing public interest groups on the plaintiff side, explained, the FCC has absurdly tried to separate Internet access from functionality that’s necessary to providing that Internet access—specifically, caching and domain name (DNS) services. These technologies are implementation details of how the Internet works, not separate services in their own right. The FCC’s insistence that DNS lookups are a separate class of services is dishonest. In the old days, telephone companies had operators manually connect users for long-distance calls, and those operators could also give callers information. This didn’t mean that Bell was providing an “information service” on top of the telecommunications layer. The operators, like DNS, are there because they have to be to make the telecommunications work seamlessly for a user. Simply because they can also provide information doesn't make them not a fundamental part of the technical implementation. As we’ve pointed out before, the FCC’s false distinction between “Internet access service” and “a distinct transmission service” is utterly ridiculous. There simply isn’t enough competition for most users to have a real choice. As over 190 engineers said in their July 2017 comments, “Simply put, customers expect their ISP to route their traffic as 'part and parcel of broadband Internet access service' because it is a necessary functionality for the transmission of data in any modern network.” The FCC’s intentional misinterpretation of the law (which is necessary for its repeal efforts) led one judge on today’s three-judge panel to ask the agency whether they were describing a "telecom service via a telecom service,” which gets at the gamesmanship of incorrectly interpreting the law to fulfill an industry agenda. Throughout its dismantling of the Open Internet Order, the FCC has argued that dodging its responsibility to protect net neutrality will have no negative effect on Internet users; they’ll simply be able to move to another provider. That’s not true. For one thing, there simply isn’t enough competition for most users to have a real choice. As Mozilla’s lawyer Pentelis Michalopoulos pointed out in the argument, over half of Americans have only one choice of broadband provider. A judge prodded him on that point, noting that many Americans have made the choice to stick with slower wireless Internet. But that observation only exposes the flaw in the FCC’s argument: due to a severe lack of competition, the market has failed to bring high-speed, competitively priced Internet to most Americans. Given the lack of serious competition in high-speed broadband Internet—and, as a practical matter, the extreme difficulty that users often find in trying to switch services—consumer pressure alone won’t stop ISPs from engaging in unfair practices. As plaintiff attorney Kevin Russell noted, a small group of ISPs with concentrated market power can effectively dictate the terms of service for everyone. The FCC has ignored evidence that the [ISPs] have the incentive to hurt edge providers as well as the ability to do this with impunity. [...] There’s ample evidence in the record that they get away with impunity [because] subscribers cannot leave when they do a bad thing. They can block, throttle, and degrade, and nobody leaves. The FCC argues that in absence of the Open Internet Order, the Federal Trade Commission can still punish unfair ISP practices. But in today’s argument, FCC lawyer Tom Johnson exposed the flaw in that reasoning: when asked whether discriminatory practices like throttling and site blocking would still be “deceptive” if ISPs disclosed them, he said that they wouldn’t, meaning that they would not fall under the FTC’s jurisdiction. Specifically, the court asked if either the FCC or the FTC would be allowed to stop Comcast from letting Hulu pay for priority and then de-prioritizing its competitors, as long as the ISP discloses the arrangement. The FCC acknowledged that these abuses are now possible under the Restoring Internet Freedom Order. In other words, the FTC cannot replace the FCC as enforcer of net neutrality, and the FCC knows it. Lastly, current antitrust law does little to get at other real problems presented by ISPs disfavoring content. U.S. antitrust law is primarily an economic doctrine that gives little if any weight to noneconomic values. Without significant changes, it’s poorly suited to addressing the threat that discriminatory ISP practices bring to freedom of expression. Following the FCC’s vastly unpopular decision to repeal net neutrality, states across the nation began taking up their own proposals to step in to protect users in the absence of FCC rules. Central to this debate at the D.C. Circuit is whether the FCC has the power to prevent states from regulating broadband companies. The FCC can’t claim that it lacks the authority to regulate ISP practices and simultaneously claim that it has the authority to preempt states from doing so. Representing the states, attorney Stephen Wu argued that state lawmakers have always had a role in regulating the industry and that the FCC overstepped its bounds. As Wu noted, the FCC can’t claim that it lacks the authority to regulate ISP practices and simultaneously claim that it has the authority to preempt states from doing so: “Those two propositions can’t exist at the same time.” In short, Wu said, “What the Commission has said is, ‘We have free floating power to preempt in the absence of statutory authority.’” That’s a dangerous claim by an unelected agency. Why does the FCC believe it can preempt states despite having no legal authority to do so? It stems from a last minute ask from Verizon and other large wireless service providers: the wireless industry wanted the FCC not just to preempt state net neutrality laws, but also to say that the states can’t protect their citizens’ privacy from ISPs. The FCC did not go so far as to say state privacy laws were preempted as well (that would be an extreme stretch), but it did state that “anything inconsistent” with the Restoring Internet Freedom Order was preempted. That decision bought the industry time to stall California’s strong net neutrality law, which might have been the entire point. The dangers of a world without FCC oversight over the industry was in stark display last year, when Verizon throttled the wireless broadband service of firefighters in the middle of a state emergency. The FCC has continued to ignore Verizon’s conduct still to this day—likely because without its Title II authority, it can’t do a thing. Large ISPs have enough advantages already without federal agencies handing them even more. Santa Clara County’s lawyer Danielle Goldstein argued before the court that the FCC simply cannot abandon its duty to regulate the broadband industry because it has an affirmative duty to ensure that the industry protects public safety. In the FCC’s vision of the future, if problems occur that impact public safety, those local government agencies can complain after the fact. But as Goldstein pointed out, it’s not rational to expect public safety entities to come to the FCC after an emergency occurs rather than rely on the agency’s oversight when the emergency happens. Today’s arguments demonstrated what the vast majority of Americans have recognized for a long time: the FCC is wrong on the technology, wrong on the economics, and wrong on the policy. 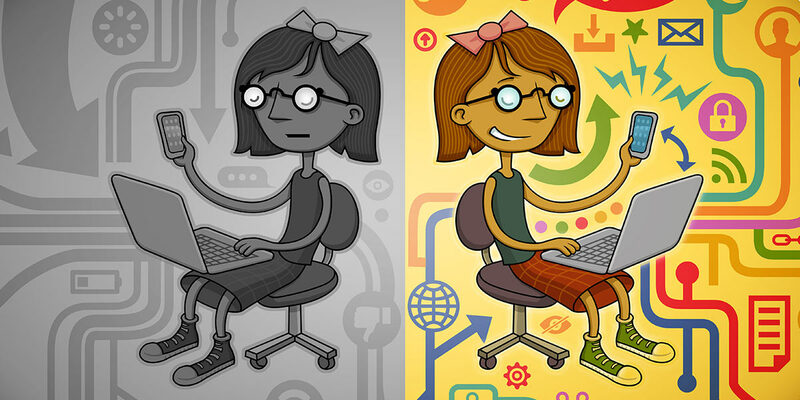 Clear protections for net neutrality are essential for an Internet where everyone can speak up and participate. Large ISPs claim that net neutrality protections somehow harm competition among Internet providers, but their smaller competitors know that the very opposite is true. Large ISPs have enough advantages already without federal agencies handing them even more.